It's not just the lighthouse that gets the big wave. No fishing from the harbour wall that day! A pigeon, one of the Bell Rock messengers, arrived at Arbroath on Tuesday from the Lighthouse, in 10 minutes, with despatches, bearing that all were well. On the 25th another feathered mercury arrived in the same place on a similar message but it was an hour in accomplishing its journey. The Bell Rock Pilot. - James Spink died at Arbroath on the 9th curt. aged 85. He is prominently noticed in the Account of the Bell Rock Lighthouse, connected with the operations on the 2nd September 1807, when he providentially arrived at the rock with letters from the shore, and was the means of saving the lives of the Engineer and 31 Artificers - at a time when the Tender had drifted, and the tide was fast rising upon them! For this service he was allowed a small pension from the Lighthouse Board. Spink was a very trusty pilot, and a fine example of a tall robust fisherman, whose figure in his pilot's dress and large bonnet has been well preserved by Howe, in a full length, leaning upon his boat with the Bell Rock Lighthouse in the distance. The pilot's jacket and badge were laid upon the mort-cloth at his funeral, which was attended by several of the principal merchants and shipmasters of Arbroath, and by the master and crew of the Pharos Bell Rock Tender. Bell Rock Lighthouse - The light-keepers lately witnessed a severe struggle between a large and very powerful conger eel and a seal, on the surface of the water, at the Bell Rock. The eel twisted its tail round the seal, which for a time greatly annoyed it. The contest, however, ended in the defeat of the eel, which was soon torn to pieces and devoured by the seal! For several weeks past a great shoal of small herrings has been seen from the lighthouse, while the rock was under water; and both fish and sea-fowls of all kinds resort to the rock in quest of prey, attracted no doubt by the herring shoal. BELL ROCK LIGHTHOUSE - During the late heavy gales which have done so much damage to shipping, particularly between the 19th and 23rd ultimo, the sea-sprays appear, by the monthy returns from the Bell Rock Lighthouse, to have risen upon the building to the height of from 60 to 90 feet every tide. While this heavy sea run, one of those great detached masses of stone, familiar to the lightkeepers by the name of "travellers", was forced across the rugged surface of the rock about 100 yards to the Lighthouse where it destroyed part of the cast-iron landing-wharf. This stone measured about 7 feet in length, 3 and a third feet in breadth, 2 and a half feet in thickness, and must have weighed about 4 tons. To prevent mischief by the movement of these great stones, the lightkeepers are provided with quarry tools, with which they broke it up and arrested its progress, but it was no easy task from the run of the sea. 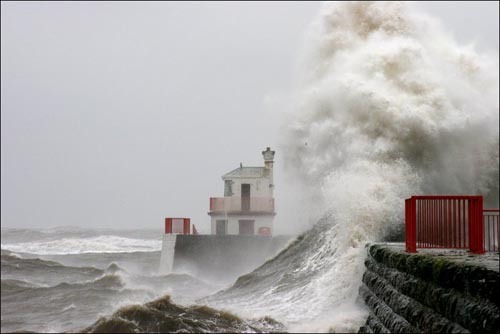 The heaviest seas which visit the Bell Rock are from the north-east, but present the gale was chiefly from the north-west; and it is not a little remarkable that the Frith of Forth was but little affected, during this storm, above the Island of May. A WANDERING PIGEON. - On the evening of Sunday last a pigeon alighted at the Bell Rock lighthouse, was fed, and let go again on Monday at 10.45 a.m. A writing to this effect was tied to its neck, with the addition that the pigeon left all well at the lighthouse, and asking to forward the note to the Bell Rock signal tower, Arbroath. Yesterday, the writing which has been fastened to the pigeon was received at the signal tower along with a note from Capt. Gill, of the steamer Clunie, of Aberdeen, dated at Peterhead on Tuesday. Capt. Gill stated that the pigeon was caught on his deck off the Girdleness on Monday night. Bell Rock Lighthouse Service - The usual fortnightly relief of the Bell Rock light-keepers by boat service direct from Arbroath has been discontinued. After this week, the light-keepers will be relieved, fortnightly as formerly, by steamer from Granton, the relief men going and returning from Granton by rail. Mr R. M. Ballantyne, the popular and prolific writer of stories for boys, died on Thursday last in Rome, whither he had gone for the benefit of his health. Mr Ballantyne was a native of Edinburgh, and was born in 1825. One of his most interesting stories has Arbroath for its locality, and he has woven into it a narrative of the building of the Bell Rock Lighthouse. R. M. Ballantyne spent 16 days (April/May 1865) on the Bell Rock Lighthouse to gain first-hand knowledge and to research the background of his new boys' adventure story "The Lighthouse" published later that year. For some time past the Scottish lighthouse authorities have had under consideration the difficulties attending the night visits to the Bell Rock Lighthouse, where a landing can only be carried out at low water of the highest spring tides. During the last visit of the Pharos to the Rock to carry out the periodical relief or change of keepers and the landing of stores. Her Majesty's dispatch boat Jackal was, by an arrangement with the Admiralty, in waiting for the arrival of the Pharos to experiment with her "search light" in the operation of landing and carrying out the relief. The light was flashed on the rock and the work was carried out with as much ease as if it were daylight. The experiment having proved successful, the Commissioners will probably fit up a search light on board the Pharos. A LIGHTHOUSE INCIDENT. - An incident of a peculiar nature occurred at the Bell Rock Lighthouse on Wednesday. At 11 p.m. on that date the keeper on watch was startled by the sound of a steamer's whistle in close proximity to the rock. On going out on the balcony, the steam tug Alexandria, of Arbroath, was observed in the clear moonlight within hailing distance. A strong westerly wind and the beat of the sea against the base of the tower made conversation somewhat difficult, but it was understood that the tug had been sent out from Arbroath in response to signals which were reported to have been shown from the Rock that day. On being assured that all was well, and as no landing could be effected at the time, the tug returned to Arbroath. The solution of the mystery is as follows: - When signals are made from the Rock, two-feet discs are run out on poles which project horizontally from either side of the balcony. Daily observations are taken by the keeper on shore duty in Arbroath (a distance of 12 miles from the Rock) by the aid of a powerful telescope, and what appeared to him to be two discs on the south-west pole, which reads "Send boat immediately", was in reality two cormorants, which, tired out at the fishing, had unwittingly made themselves intelligible by appropriating the signal pole as a roosting place. The Bell Rock Lighthouse - Despite the inclemency of the weather, the work in connection with the alterations at the Bell Rock Lighthouse, involving the construction of a new lantern, is being rapidly pushed forward. The removal of the old lantern and parapet wall was a more laborious undertaking than had been anticipated. Strength and stability were the outstanding features of the old erection, carried out to an extent that would probably be considered superfluous in these days. Octagonal outside, circular within, the parapet wall was composed of five courses of Craigleith freestone, each course feathered and grooved, while each stone dovetailed its entire depth into its neighbour. At each point of the octagon, holes were drilled from top to bottom of the wall to received the 2-inch iron bolts which secured the heavy cast-iron lantern to the parapet. It was found necessary to reduce each stone to fragments before hurling them into the sea in order to prevent them from obstructing the boat tracks or damaging the gratings. Between the outer and inner linings of the copper dome a scrap of newspaper was found wrapped round what appeared to be a file handle. The printed matter was quite legible, and bore reference to an unfortunate episode, happily long since relegated to the realms of oblivion, namely, an investigation into the conduct of the then Princess of Wales in 1806. In one of the ventilators which passes the parapet wall on a level with the balcony, but long since disused, a perfectly dessicated specimen of a wren was found. Attracted probably by the light while on a migratory journey, the bird had evidently taken shelter in the ventilating tube just prior to its being plugged up with a wod of tow, a material which for many years has been superseded throughout the service by cotton waste.